The “true” self, according to Harris, is a virtual representation of the player’s self-perception but may not equal the perception others have of the player. The “heroic” self is also a representation of the “true” self but with all positive or all negative attributes greatly exaggerated. The “powerful” character is designed to be effective within the realm of the game: gaining levels, completing quests, and completing the game. The “fantasy” character represents the “true” self but shows “aspects of the player… that are completely [unfeasible] in the real world.” The “random” character is not built toward any goal but it just an interesting choice for the player and serves as a distraction from the real world. So that is the point I would like to focus on today. How do the varying selves that Harris outlined apply to the problem proposed by Madigan. For that, I feel the best game to look at is Little Big Planet(LBP), a platforming game based around collecting prizes and customization. Where the customization runs wild and the clothes don’t matter. No really, they don’t. That’s how my sack girl can wear the laciest of costumes and not trip and fall. This is one of my many saved costumes. It’s usually the one I wear when I play with my friends and family. There is a lot of pink on this costume, so let’s start there. Pink is stereotypically a female color. It is delicate and friendly. It is combination of red, the color of passion and primal nature, and white, the color of purity. This costume even has nice rounded fairy wings and large white polka dots, which as we know are circles, and as I have explained before: circles are safe, squares aren’t really safe, and oh-dear-God don’t touch triangles they’re all trying to kill you. But what self does this represent for me? I only have control over the costume, and there is no warrior build and no reason to wear mystical armor to boost my mage talents-so why do I have pigtails and bunny ears? Ah, my true self. I was born in the year of the rabbit and I’m a big fan of the Chinese zodiac (it lets me call my sister a rat and my mother a horse, best thing in the world). And I bet you wouldn’t figure it out on your own so I’ll just go ahead and tell you: I like pigtails. Within the constraints of the game, I can’t create the heroic, fantasy, or powerful self characters because they involve character traits which are just not present within platformers (least of all LBP, so we’ll touch back on these selves in another post). But I can certainly create something I find interesting. 1. Here again, all pink and safe and BUNNY EARS! This is just another me-oh wait-did you notice? Sharp, pointy teeth. I play in this costume when I play the competitive levels. I also play in #2 and #3. 2. High contrast, sharp teeth, a passionate red, a sleek (also negative) black, and vampire bat wings. But this costume shows something else, something that #3 also shows. 3. This costume is only available to obtain in the last and most difficult levels of the game. This shows my level of skill. These costumes show things I’m interested in but they also show something else: my level of skill. The red haired sack girl with bat wings and the sack girl in the Russian outfit are wearing costumes that are only available in the final and most difficult levels of the game. Some times my costume choices are to show my expertise, but most of the time they are a structural choice. My mother’s characters are usually green, my sister’s characters are usually tan, and my light pink character with white bunny ears tends to stick out making my character easier to follow when we all play together. The same is true of option #2. The bright red hair makes the character stand out from the background. In a world of customized characters, the choices are not necessarily about what represents the user but what the user can see. 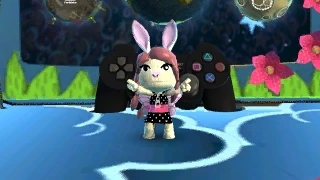 I also had a plethora of saved costumes in Little Big Planet but they all depended on who I was playing with or not. For example, if I played online with random people I would wear a “Disco baby” costume, with the disco ball skin, a pacifier, and a baby bonnet. Sometimes I would carry a mini sack-person doll and other times a rattle. This isn’t channeling my inner self at all – I certainly am not trying to be a literal baby or a disco fanatic – but it was how I wanted to present myself to other players. I was drawing attention to myself (I flashed different colors). Everyone that was playing with me was looking at me on the screen. It was like nominating myself to be a leader of the group. When I played with my friends, I had a much more subdued Red Riding Hood style outfit. It shouts out to our love of fantasy things, and goes along with character type #4 you describe. I agree with you that it’s difficult to represent the self completely in games like this, where customization just gets wacky. But there are definitely ways to show your personality, which is a version of the self. This was interesting to me, given my own love of online games. Thinking to my WoW characters, I’m forced to think that my main (a pandaren monk specced for healing) is a combination of true/fantasy (can’t be a panda in real life). And yet, generally, in most games I focus toward making a “heroic” self. Growing up all I ever wanted was to be a knight (hush, I know), so I tend to make characters like that in Skyrim, etc. The Skyrim character I clocked a good 200 hours with never once did something evil. She just saved people and rode around on her horse with her werewolf-husband. I almost never play mages because physical strength — which is possible in the real world — is more appealing to me than magical. I also think it’s interesting how character choices often cause other players online to make assumptions. Once I was asked “Why is it girls only ever play healers?” Whereas, on WoW, hunters are considered characters for more “noobish” players, etc. Certain types of people seem to drift towards certain representations. It’s pretty interesting/weird to think about.